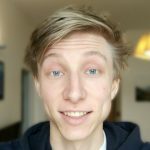 This year is almost over and before I do a final 2018 recap, I would like to share some information about what’s going on in Prusa Research right now. It has been a busy year, we brought new products to the market, announced new machines (our brand new resin Original Prusa SL1), kept updating and improving our software and firmware packages, launched our own filament, we traveled the world (check out our events page!) and met our customers … I feel we have done a lot of good work. But I understand that we have also made some promises, which we still need to fulfill. So let’s take a look at what you can expect to happen in the upcoming weeks. Powder coated sheets manufacturing is a neverending story. It’s incredibly difficult to manufacture them in high quantity, while keeping great quality. The scrap ratio is so big that sometimes I would love to just outright cancel them and move on. But, on the other hand, the ones we make are very good and it would be a shame to throw away all the experience we gained during the preparation and production process. Either way, I should stress out that we have thousands and thousands of users, who are more than happy with the smooth PEI sheets. After all, it’s a high-quality surface, which gives your prints a nice smooth finish of the first layer, it’s easy to maintain and it has great adhesion properties. Plus, the printed objects can be easily removed by simply bending the sheet. And last but not least – it’s compatible with a wide range of filaments. In other words: it’s a great alternative and if you want to start printing immediately, there’s no reason why you should avoid smooth PEI sheets. Anyways we are still trying things how to improve the yields and make it ready for prime time when we can just order 10k pieces batch and just put them on the e-shop. In the meantime here’s what’s going on with the powder-coated sheets: right now, there is a group of about 17.000 customers waiting for discount vouchers for the powder-coated sheets – these are the people that didn’t have the option to select the type of sheet for their printer. Our supplier is able to supply us only with several thousand good quality sheets per month, however, we also need to bundle these sheets with new MK3 printers that we sell – and that’s also several thousand units per month. I understand that this is not a fair situation and customers who have been waiting for the sheets for many months should be prioritized. This is why we will finally start sending vouchers to those customers, who are waiting for the longest time. That will be the first 1.000 vouchers batch in the upcoming 24 hours 48 hours, the rest will follow in upcoming weeks to allow time to make orders to keep the position in the line. Option 2: Free Smooth PEI sheet with free shipping – totally free! You can select one of these options. Also, we will stop selling new printers with powder-coated sheets until this situation is resolved. Once you receive the voucher and complete an order, it may take a couple of weeks (for the first batch). The reason is that we want to process these orders by the country of destination. Also, it won’t be possible to add anything to the order as it will be mass mailed. I’m sorry we’re doing this a bit late, but almost every month for the last half a year we’ve expected we would finally have enough sheets for everyone and this lead time even for sheets won’t be necessary. We will also update our shipping table, so you can see the current processing/shipping times for powder-coated sheets. At the same time, the increase of the leadtime for kits with the powder-coated sheets is to be expected and will also be displayed there. And we’re not forgetting about Amazon, of course! What we want to do is to send a shipment not only to the USA but also to other Amazon stores around the world (like Canada, United Kingdom etc.). The current demand means that we have to send a huge number of spools, otherwise, you would see “Out of stock” message way too soon. We want to actually sell Prusament through Amazon, not just to be listed. 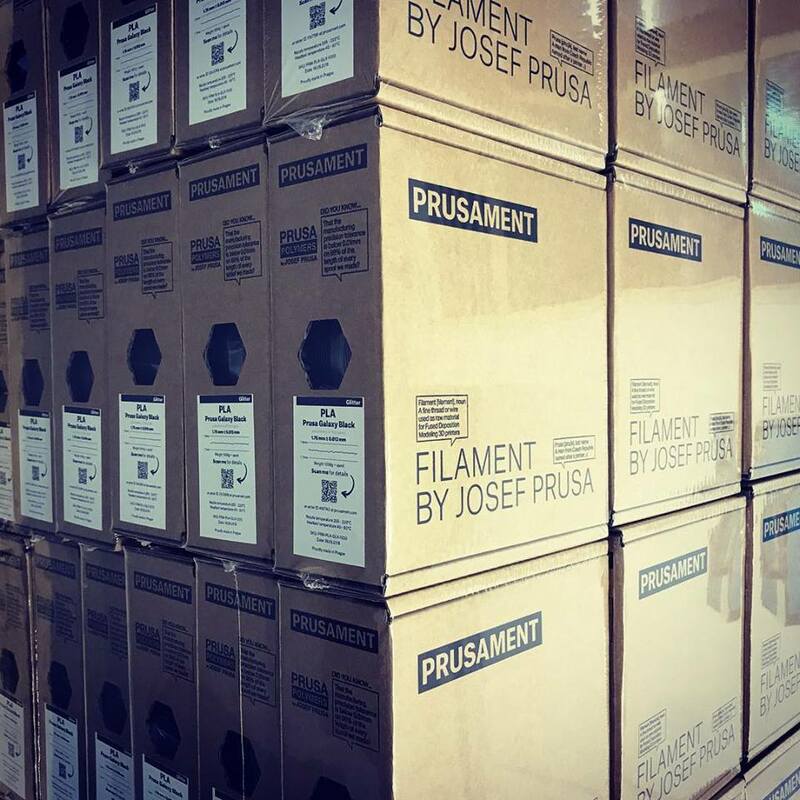 🙂 Prusament will be definitely available on US Amazon stores before Xmas 2018. Follow us on Twitter, Facebook or Instagram for upcoming updates. A few days ago, we have started shipping the Multi Material Upgrade 2.0 for owners of the Original Prusa i3 MK2.5. It took us longer than the MK3 version. As you probably know, the MK2.5 operates on 12V, while the MK3 runs on 24V. The jump to 24V on the MK3 was an important change because it allowed us to make some really nice tricks with the electronics. However, the MK2.5 is 12V and it brought two major issues: the electronics are different (miniRAMBo vs. Einsy RAMBo), so we had to prepare a special cable for powering the MMU2.0, and also we had to tweak the firmware and print profiles in order to keep the device quiet – which is not easy with the 12V PSU output and it required a lot of extra work (you can see the loudness optimization mentioned in the Github release log). So the MK2.5 MMU2.0 should be already with the first customers, which also means we published the new firmware v3.4.2, Slic3r PE v1.41.1, and a new driver package. Be sure to download them to get all the latest software packages, drivers, sample G-codes and utilities. Please note that the firmware 3.4.2 is aimed at MK2.5/MMU2.0 owners, while the rest of customers can safely stay at 3.4.1. btw: new RC of 3.4.3 should be out before the end of next week. Also, speaking of Slic3r PE, the new 1.41.1 build brings (apart from minor changes and bugfixes) one major new feature: the first version of custom supports! 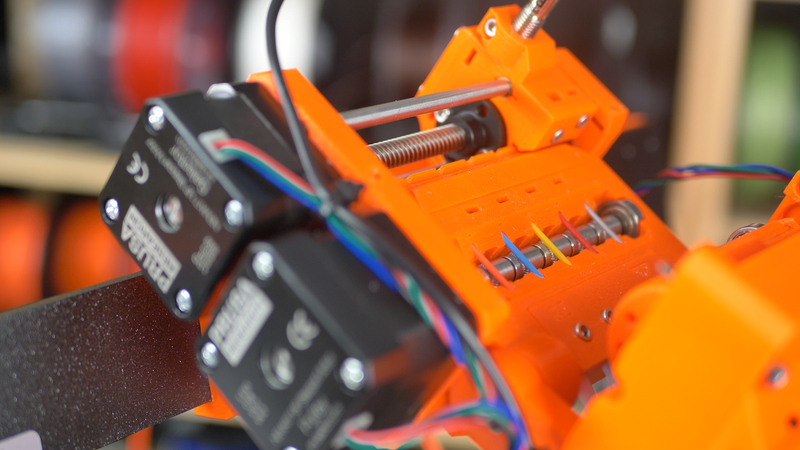 The Original Prusa i3 MK3 just celebrated its first year since the announcement back in September 2017. Throughout the whole year, we’ve been collecting testing data not only from our farm but also from our customers. We’ve been carefully listening to your ideas, complaints, and requests. Many of them have been already implemented and some are still to come. 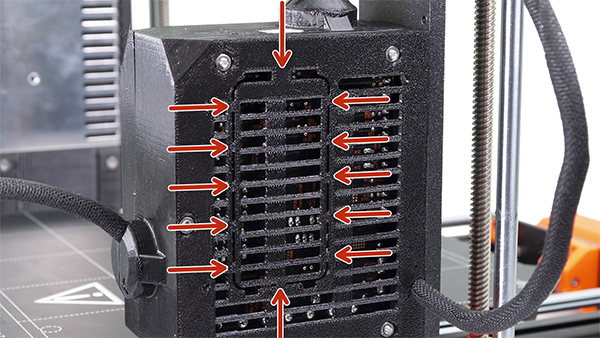 Observant users already noticed that we are continuously improving the printed parts. The latest batch brings minor changes that will result in easier assembly of the printer, so there’s very little reason for end customers to start printing new parts. However, there’s one change that might interest someone – a modified Einsy RAMBo case. As you are aware, the MK3 is compatible with the Raspberry Pi Zero W, which can run OctoPrint software and allows you to do many cool things and also control the printer remotely. The previous iteration of the Einsy case required you to completely remove the board from the case before inserting the RPi, but this changes now! All the Einsy cases, which will leave our factory are now ready for the Raspberry Pi and there’s no need to disassemble anything. Look at the back side of the cover, where you will see a part in the middle, which is separated from the rest by several small “bridges”. In case you want to use RPi, carefully cut this entire part out and insert the tiny Pi board inside. 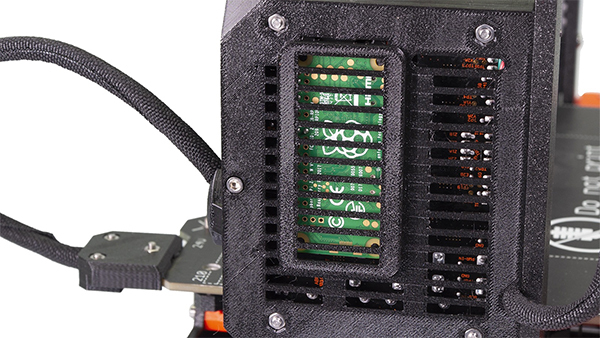 Our developers prepared a removable cover, so you can shield the RPi and remove it if necessary. In case you missed the recent MK3 extruder upgrade, check out my previous article. Otherwise, to learn more about the new parts, head to our discussion forums. All parts are available for download from our website. And that’s all for now. I understand that for many of you, the most important piece of news is related to powder-coated sheets. As I wrote at the beginning of this article, the first group of customers can expect to receive a discount voucher via e-mail in the upcoming 24 hours 48 hours. In the meantime, you can check out the Slic3r and start experimenting with custom supports. Plus, we will be looking forward to your ideas and suggestions for the new Slic3r PE user interface! I ordered an MK3 and MMU back in May. Had the MK3 for a while and received the MMU earlier this week (yeah it works!). Been wanting the powder-coated sheet but it looks like that isn’t going to happen given how many are already waiting for it. Should people that ordered a MK3 from elsewhere (Voxelfactory in Canada) expect a voucher, or will we have to contact support? I am interested if I have to contact Prusa for my voucher or is it coming automatically. and of course the time we might expect to see the vouchers to be sent out if that is possible. hi Mikola, whats about new orders? is there a chance for a voucher for the powdered one? I spoke with Voxelfactory today, I was one of the lucky people in their first shipment of mk3s. They are currently talking with prusa and trying to figure out how it will work. No eta yet. One tool I love in Prusa Control that I wish Sli3r has is the ability to move objects via mouse clicks. I have a few designs that are 250mm wide and unless I use auto arrange they won’t fit on the Sli3r platter. To make everything work I either have to set up a huge stl for all the parts aligned in Tinker Cad or I get everything set up in Prusa Control, save as a .prusa file, and then load that file in sli3r for printing. I know I can slice in Prusa Control but using default settings results in a poor print in comparison to Sli3r. I’m a huge fan of the MK3. My prints are great and look better than many of the pictures online but my experience with the MMU2.0 has been quite the opposite. I haven’t had a single successful multi material print since I got it a week ago. I’m having the same problems as the 0calvin guy on YouTube and the user interface (looking for blinking codes instead of using the screen) leaves a lot to be desired. It’s great to innovate but quality should come first. I hope you listen to user feedback and react quickly so you can continue building a great brand. So, what does this mean for anyone you’re “forcing” to have to order with the smooth PEI sheet? I’m planning on ordering mid month … so will we ever be able to get the powder coated sheet? Great question, I have that same question too. What happens with new customers regarding the powder coated sheet? I have this same question too. Will new orders forced to choose the PEI sheet receive a voucher too? Nobody’s forcing you to do anything 😛 As soon as we have big enough stock of the powder coated ones, we’ll re-add them as an option 🙂 Now you get what you order without any additional vouchers. I hope that someone can clarify the sheet thing. I ordered my MK3 w/ the PEI sheet, because I didn’t want to wait. But I want the powder coated sheet! I hope that folks in my situation will be given the option to order them. Of course, I’d really like to order some PEI sheets, too, because the PET that I use is really chewing up coating. Are these available? Can’t find them. Lastly: many thanks to Mr. Prusa for making such remarkable products. I cannot tell you how much I love my printer, how wonderful it works, and how reliable it is. You have to login to the shop to see MK3 parts (I assume you ordered it in Prusa eShop and not some reseller). If you did not order your MK3, look at the shop you ordered it. They should have the powedercoated sheet listed (subject to availability). Maybe you should consider another PET Filament if yours is chewing up the PEI sheet. Are you going to send an email asking for these options before scheduling shipping the powder coated sheets? I’m sure it will make your planning easier. If I go for option2: PEI sheet, it is just the PEI film or a steel sheet with PEI? this is understatement, I’m waiting a year for it! that is 12 months! I was considering purchasing a mk3 kit soon. 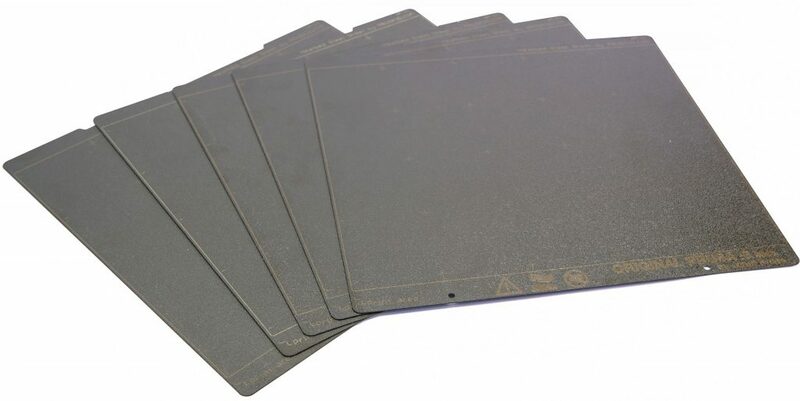 Just to clarify, are you planning on offering the powder coated sheets again in the future for those who order now (where it’s not an option) or are you going to be stopping production once the backorders are sorted? We will offer them again and hopefully have even some for sale alone on the e-shop.